« What’s the Story Behind Your Pet’s Name? Did you know what these little Australian critters were? 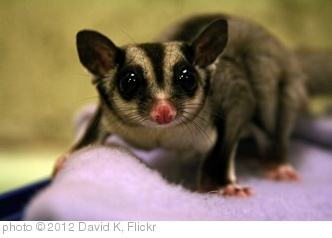 A: This little marsupial (adults only wieght 4oz) is a Sugar Glider. Like other maruspials, they raise their babies, known as joeys, in a pouch. Cute, aren’t they? If you guessed right, you get an entry into the January Pet Pop Quiz Contest. Be sure to stop by next Monday for another chance to get an entry. How cute!! They’re shy critters!